How many times have you tried to change a habit and failed miserably? (I know I'm not the only one whose New Years' Resolutions are forgotten long before Valentine's Day...) And then you feel like a failure, you curse yourself for your lack of willpower or stamina, you beat yourself up for not being able to stick with that diet or pay off that debt or swallow those snarky words that hurt your partner or children. 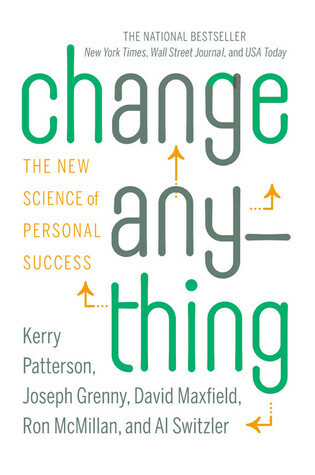 Well, according to the team of authors who wrote Change Anything: The New Science of Personal Success, it's not about a lack of willpower, it's about changing the whole process of how you change. And changing is a skill anyone can learn. * Visit your default future. Figure out what your future will look like if you don't change. * Tell the whole vivid story. Describe that future as vividly as possible to make it seem more "real." * Use value words. Articulate the "why" for your change in positive terms. * Make it a game. Set a time frame and smaller goals to help you reach the big one. * Create a personal motivation statement. This will help you stay on track when you hit those crucial moments when you are more likely to fail. * Build fences. Set manageable rules for yourself. * Manage distance. Removing the temptation or sometimes just moving it a few feet further away can make a big difference. * Change cues. Use automatic reminders to help your stay on track. * Engage your autopilot. Make your default bias work for you by setting up positive defaults, like standing appointments, automatic withdrawals, etc. * Use tools. Technology is powerful and can help or hinder your progress depending on how you use it. One thought I found particularly insightful was regarding willpower. "Will is a skill, not a character trait. Willpower can be learned and strengthened like anything else, and...it is best learned through deliberate practice." This makes sense. If we view willpower as a static character trait, we're more likely to think that because we've failed once, there's no use in trying again; we just can't do it, it's hopeless. If instead, we, view will as a skill that can be improved, there's always hope for that improvement and the encouragement to keep trying. Also, a good reminder for any goals we set, "Reward your actions, not your results. Results are often out of your control...so link your incentives to something you can control." We can't set goals for what others are going to do because we have no control over that. Our goals must be based on actions we can control or it will be too easy to lose heart. Don't expect to be able to identify all of your crucial moments and vital behaviors at the beginning. Your progress won't follow a straight line. You'll hit binges and setbacks, but treat these challenges the way any scientist would. Examine your failures with curiosity and concern, not self-condemnation. You'll quickly discover that you learn more from your failures than from your successes...Learn, adjust; learn more, adjust again. Make even your bad days become good data. I love the idea of "examin[ing] your failures with curiosity and concern, not self-condemnation." We all fall short of our ideal, despite all our efforts, and treating those moments as opportunities to improve our method of improving instead of opportunities to belittle ourselves is a much healthier approach. At times it was difficult to differentiate between some of the categories the author present, in particular the two facets of Social Sources seemed to work in tandem, but I appreciated the well-rounded and forward-thinking approach they demonstrate to making and maintaining positive changes, and the concrete tactics they describe. The book has a related website, www.changeanything.com, where you can register your own plan for personal change and access additional helpful tools and tips. Or go check it out at your local library (find the nearest one here)!